The Body Solid G10B is a Bi-Angular Technology. The Bi-Angular Press Arm guides you through the optimal range of motion while applying resistance from two directions. The smooth, multi-directional resistance muscle interaction by more than 25 percent. 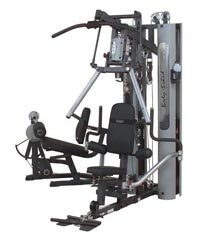 The adjustable Bi-Angular® Arms give the user several starting points for Chest Press, Shoulder Press and Incline Press. This would really allow you to do your exercises more intensely and get a more apparent result. G10B comes with the Perfect Pec Station. This machine is equipped with swivel arms, adjustable range of motion, and designed for both unilateral and bilateral movements so you can get the maximum stretch for deep muscle toning and most amazing upper body development possible. The Leg Curlof the Leg Extension Station was designed with adjustable cams to precisely fit the exercise to the user. It has also a High, Mid and Low Pulleys with Lat Pull Downs, Weight Resistance Crunches, and Standing Bicep Curls. This is a very fine piece of home exercise equipment. G10B offers a lifetime warranty for in-home personal use; this is only applicable only for the frame, pads, pulleys, and cables. For commercial use; pulleys, bushings, bearing and hardware are two years warranty. For cables, upholstery, grips and all other components are of one year warranty. The dimensions are 74 x 99 x 83.5 inches and weighs 941 pounds.